Can you confirm these amateur observations of Zonosaurus rufipes? Comment Total length up to 22 cm. Etymology Named after Latin “rufus” = red and “pes” = foot. Lang, Mathias & Böhme, Wolfgang 1989. 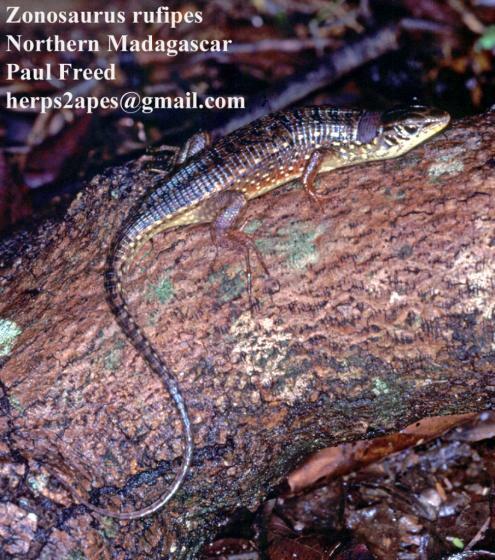 A new species of the Zonosaurus rufipes-complex (Reptilia: Squamata: Gerrhosauridae), from Northern Madagascar. Bulletin de l'Institut Royal des Sciences Naturelles de Belgique, Biologie, 59: 163-168.